This mini bike is the next evolution in pocket bikes. While maintaining the size and weight of a mini pocket bike, the GP RS-R offers a multitude of features found only on larger bikes. Just take a look at its low aggressive profile. A steeply raked fork and extra-long wheelbase provides excellent handling characteristics. But the feature that stands out most on the RS-R is its suspension system. The Rear Multi-Link Suspension System is fully adjustable and provides the exact amount of dampening and road feel to suit each individual rider. This racing suspension setup is the first in this class of sport motorcycles and a MiniPocketRockets' exclusive bike. This Top-of-the-Line GP RS-R has a monstrous Honda®-Based 4-STROKE Engine that gives this mini bike superior low-end torque while maintaining a high redline for top speed passes. 4-STROKE engines deliver more power and more torque than any 2-stroke bike, all the while using less fuel and is much quieter than all other pocket bikes. Redesigned from the ground up, this mini bike features a blacked-out C.A.D. racing frame and ultra light alloy wheels mounted with GP Treaded Racing Tires. Dual fenders keep road debris away from the rider and the bike. 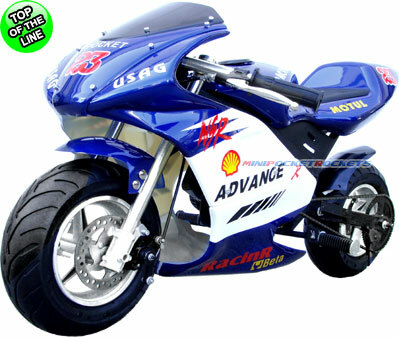 This full-fairing racing pocket bike comes practically fully assembled and can be customized to suit any rider or racer. From its adjustable handlebars and short-run, straight pipe exhaust configuration to the infinitely adjustable swing-arm suspension system and adjustable top-speed governor, this mini bike was designed to win races on all tracks and road conditions. Be the first and only to own the GP RS-R racing mini motorcycle. EPA APPROVED & CERTIFIED - OUR MINI BIKES ARE THE ONLY ONES LEGAL IN ALL 50 STATES! Included Free with Mini Bike: Bike Kick Stand, Tool Case, Tools, Motor Oil Bottle, Starter Stickers, Owner's Manual and our free extended warranty.